...and we will deliver practically anywhere! 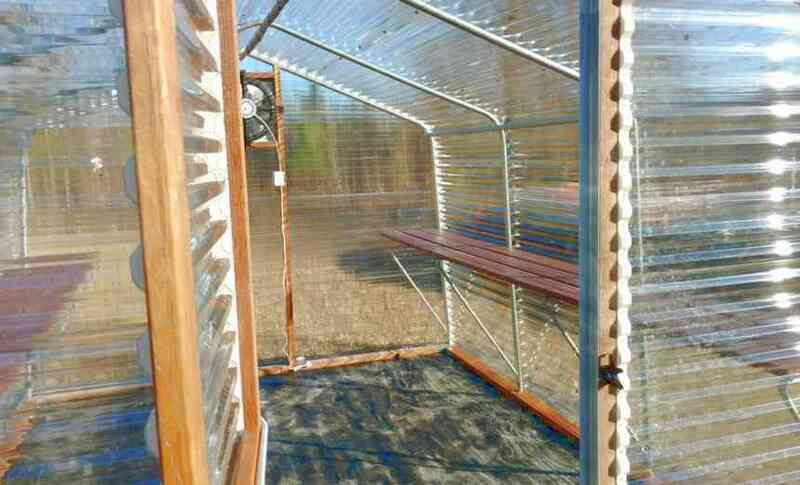 We offer high quality affordable greenhouses for sale, built to order in East Texas. We deliver to all nearby states and install them for you, so when we leave you're ready to start moving in your plants! Please compare our prices to the competition, and you'll find that our greenhouses cost less than similar greenhouse kits - and come with free installation! We build small greenhouses because fifteen years ago we needed a hothouse of our own and couldn't find one that was affordable. So we developed our own simple, efficient design, found good quality materials, and built our own. Now we pass the savings on to you, because we remember what it was like to want a greenhouse! All our greenhouses are made of 1-3/8″ galvanized tubing, which you know as the top rail from chain link fences. We bend this in a smooth bend so our greenhouses have a classy shape that fits in any backyard! Then we frame the ends with treated lumber, build a door, add a thermostatically-controlled fan and shutter for venting, and install a misting system to water the entire greenhouse at once - on a timer, so you don't even have to be home to care for your plants! For the flooring, all greenhouses come with professional grade weedblock, which is a special kind of plastic fabric rather like a tarp that blocks weeds, but unlike a tarp it allows water to penetrate. You can walk directly on it indefinitely - it's tough stuff! - or you can add gravel or wood chips on top. Our most popular greenhouse by far is our deluxe 10'x12' with unbreakable polycarbonate covering for only $1999 - it comes with venting fan, shutter, thermostat, and misting system and free installation! Or try one a little bit bigger, a 12'x16' for only 2600! Demand on these has been so high since we introduced these designs that we're building a new workshop to keep up with sales! If you compare us to any competitor you'll see why! 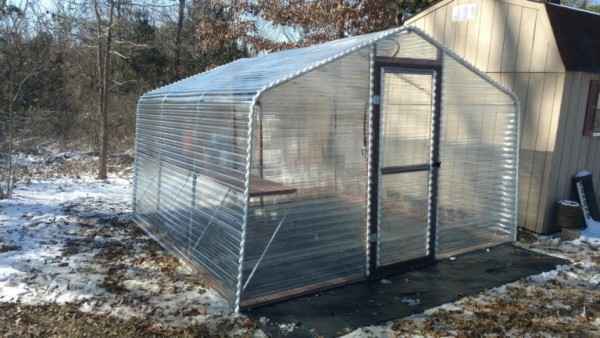 If you're wanting a greenhouse you never have to worry about again, look no farther than this greenhouse! The covering is made of lifetime manufacturer-guaranteed polycarbonate sheets. This is the same stuff soda bottles are made of – it's practically indestructible! Visit our Upgrades and Extras page to see more about all the many options and upgrades we offer! We also offer a much more economical greenhouse without the polycarbonate panels, but with 4-year manufacturer-guaranteed 6 mil plastic instead. 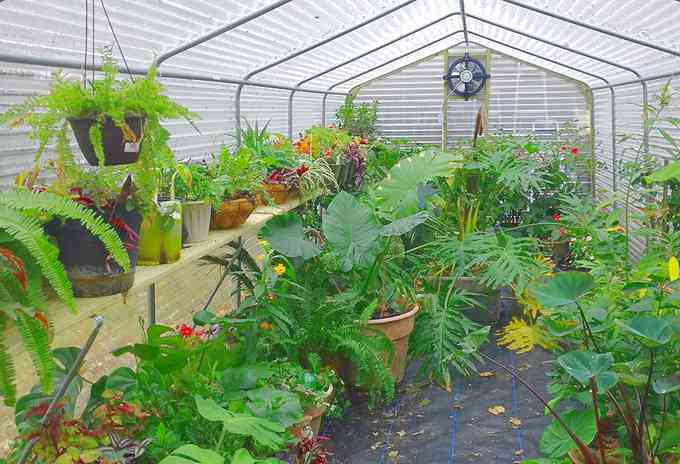 The advantage of this greenhouse is that it costs roughly half the price, and can affordably cover much larger areas. Other widths, heights, and lengths are available, along with other upgrades such as benches and misting systems - just contact us for pricing! And if you decide in a few years that you want the polycarbonate after all, we can always come back and put the polycarbonate on later. Or, for that matter, this frame can hold sheet metal for a storage building, chicken wire for a chickenhouse or rabbit hutch, rat wire for an aviary... the possibilities are endless! We designed this greenhouse from scratch, and we do 100% of the work here in our shop, so it's totally made in the USA – which also means we can modify it pretty much any way you might want it modified. If you're looking for something a bit bigger, we offer 12′ and 18′ wide greenhouses, in a variety of lengths. A typical price for an 18x40 with 4 year plastic, weed-block, fans, inlet/outlet shutters, thermostats, free delivery and installation is only $4,500! We work with greenhouses because we wanted our own, so we understand what you need and are happy to work with you on matching up the right greenhouse for your application. Although we occasionally work with larger industrial greenhouses, mostly we help individuals like you get small-to-medium sized greenhouses in their backyard for keeping houseplants, getting a head start on the growing season, or experimenting with hydroponics and aquaponics systems. If you shop around, you'll see that our delivered and installed price is cheaper than even kits of comparable size and quality! This is because we use our own efficient designs, source all the materials ourselves, and do all the work right here in East Texas! So give us a call today! Follow and Like us on our Facebook page to see our latest greenhouse installation pictures!